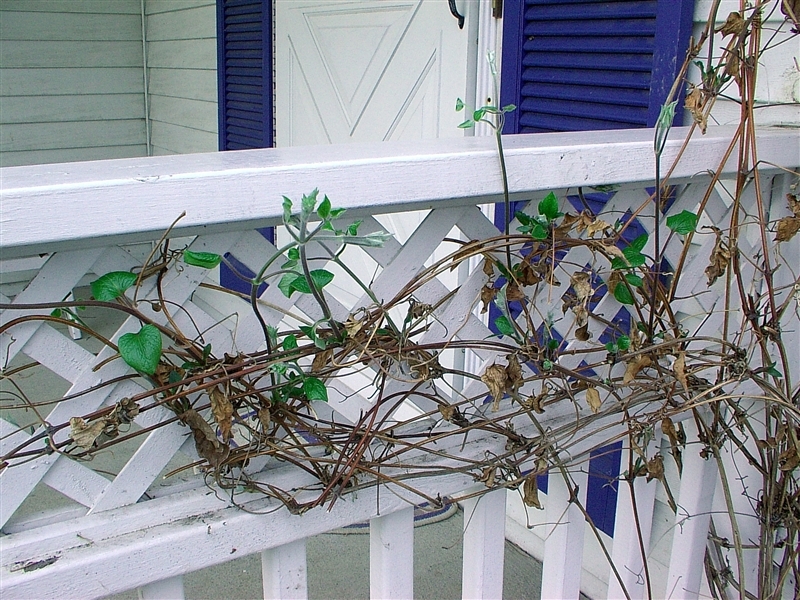 I don’t know now how long we’ve had them, these clematis vines which grace our front porch. I’ve noted with dismay that I’m further down that road than I thought, where one year turns to five to ten in a blink, where you swear you JUST did that bought that saw that – then realize it was half a decade or more ago. So my vines are timeless to me, and somehow reflective of my life journey so far, reflective of this mid-life funk I find myself in at this moment in time. 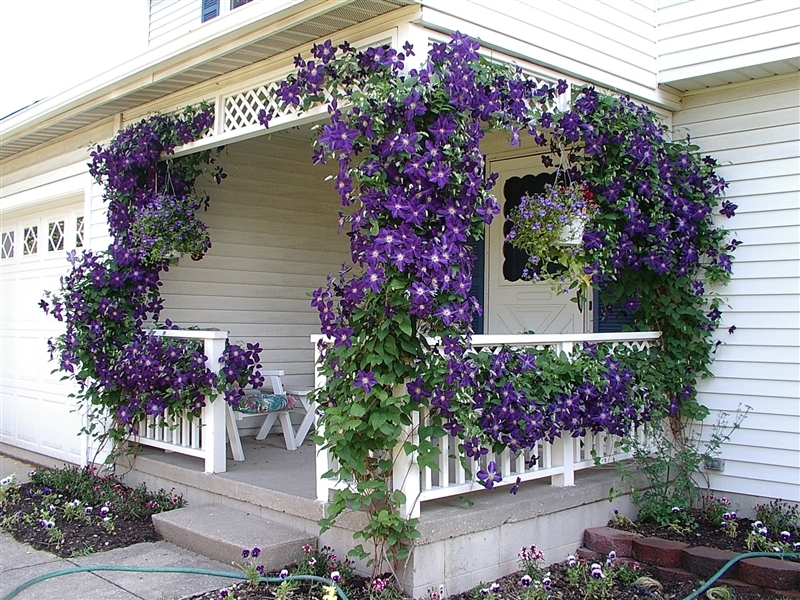 The first summer we had them, I was captivated by the sight of gorgeous purple blossoms against white woodwork. It was clean, neat, and magazine pretty. Best of all, they needed no tending, no watering, no attention at all from me, yet burst forth with glorious abandon, the very definition of plant perfection! There was a time in my life when I felt that glorious abandon. College maybe? Luxembourg YES! Blooming, finding my place, feeling like the growth was so natural and easy. Bursting with life and wanting more. 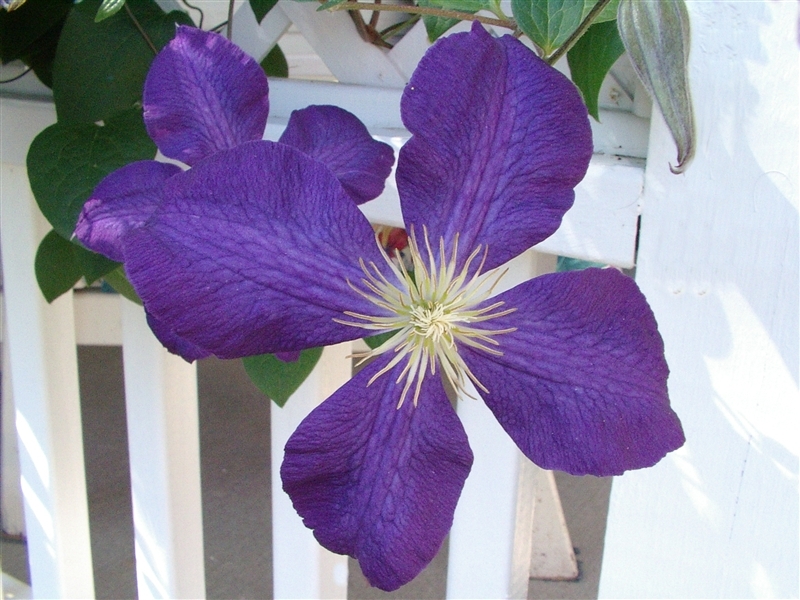 But then came winter for my clematis – and the vines which had been so graceful, so green, so lush turned ugly and brown and dead, so I chopped them off to nothingness. More life parallels: the brokenness of first love, not graduating “on time,” perhaps. The uncertainty of leaving college, starting over at life, starting at all. The next spring, new growth replaced old, and new flowers, too. Joy again! Winter came again, but my motivation was fleeting, my intentions sincere but unrealized, so the ugly dead vines stayed put this time. I’d go in and out the front door and look at the brown, lifeless vines which seemed to chide me for my laziness. Like life after college – a few jobs, temping here and there where I could. Not feeling like I was doing enough, being enough. Good intentions, lack of follow-through. But one day early the following spring, a whisper of green caught my eye. I saw a 2 inch green growth, then another, and another, and another. Somehow, miraculously, the old, dead vines I had neglected to cut put forth healthy, hardy new growth! This was how I discovered that, like grape vines, clematis USE the old growth to sprout new growth. That winter, I didn’t cut a thing – on purpose. 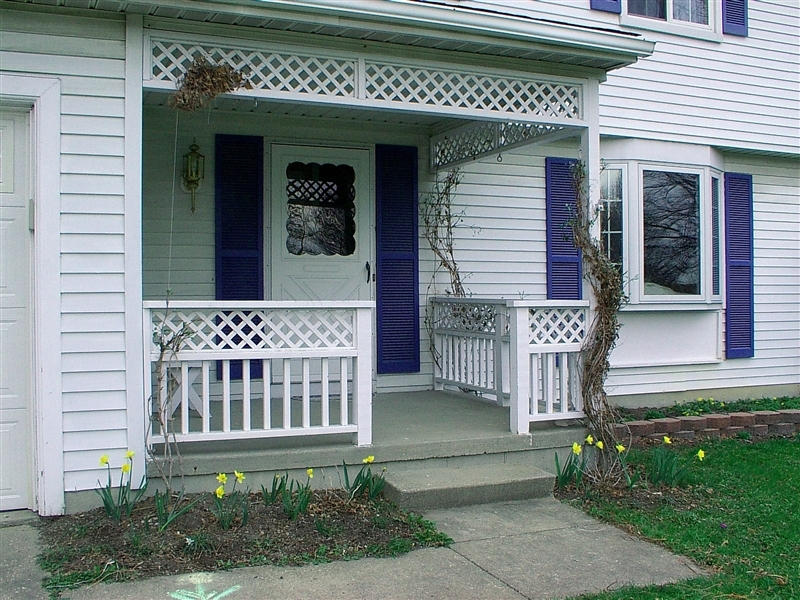 I gritted my teeth, apologized for the ugly, and assured all who came to visit in winter that yes, though our porch was hideous now, you should SEE it in the summer in all its purple glory. From my temp job, came a lead to a “permanent” job with a company large enough for me to grow. My longest job ever – 7 years! Held a few positions, got a Master’s Degree 100% paid for, all A’s. Short term plans giving way to accomplishment of longer term goals. But spring came – and near disaster. The growth was almost violent – vines furiously shoving each other aside, climbing all over each other in a mad dash for…growth. It wasn’t neat and it wasn’t pretty. It was unruly and chaotic – until the flowers bloomed, so thick and so lush and so vibrant that it took my breath away. And a vision started to form for me. My own porch-as-secret-garden-room dream, an escape, a welcome. Could I dare try to train these vines? to guide their growth? So the next spring, I tried selectively pruning. I snipped, paused, snipped again…so slowly, I worked. Snip, think, snip – and discover I’d cut a vine which, 3 feet further on, had 6 inches of new growth. Sadness, frustration. FAILURE. I cut new growth out, that I had meant to keep. It was frustrating. But somehow, the vines recovered, kept growing, and bloomed gorgeously. And I got closer to having two different vines join at the top of the porch! Another year, another chance to practice my pruning “skills” (or lack thereof). But I was paralyzed by fear of failure, so I waited too long and everything got tangled, bushy, unmanageable again. Ironically, my own fear of failure CAUSED more failure, although the vines did meet at the top of one side of the porch, despite my sad, pitiful pruning. So that brings us to this year. This spring, I started EARLY – when the new growth was only a few inches long. And I was actually excited about it! And it occurred to me, instead of starting at the base of the plant, I could start at the tips of the new growth and work backward. This method proved VERY effective for not cutting TOO much of the new growth by accident. But after so many years, I was also able to take a step back and realize that the vines will be JUST FINE, even when I *did* cut off more growth than I intended. As I was trimming, I also remembered how the very thick growth felt stifling somehow last summer, very much TOO much of a good thing. So I got brave and started pruning more and more – leaving the long, healthy new growth that would be a great base toward connecting the vines at the top again, but cutting away some of the BULK of the plant. And it felt GOOD! And it looked – fresh, new, clean, light, right. But then came the front. The front went CRAZY last year. And though I put up some twine and tried to help the plan support itself, the weight of its bulk overwhelmed it and it sagged precariously. And it was so very tangled that I couldn’t unravel it, couldn’t figure out which vines to trim. The technique I had used so successfully on the other two sections just wasn’t working. So I chopped it. Radically. From 8 feet tall down to 2. And I mourned the hasty destruction of years of growth. It felt like a huge step back. Like quitting everything, floundering, feeling directionless feels like a huge step back. But freeing, too. I’ve let go of everything weighing me down. I’m now free to grow up again, to climb to the heights. So the story isn’t finished yet, I know. The clematis is growing wildly…still, again. And maybe the vines will be healthier, prettier for the pruning. It’s still early in the season. And despite my current feelings to the contrary, it’s still early in mine.